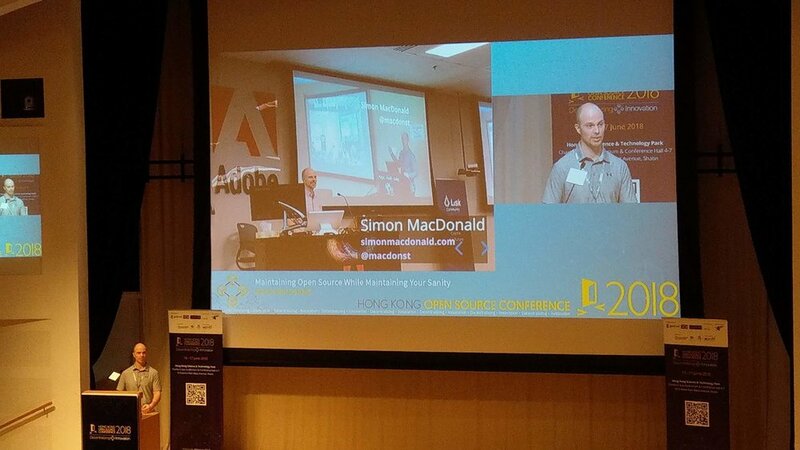 On June 16th I was honoured to keynote the opening day of the 2018 edition of the Hong Kong Open Source Conference. I was grateful to share my years of experience working in open source. My talk on “Maintaining Your Sanity While Maintaining Open Source” targets not only maintainers but consumers of open source software. For maintainers I like to give them some tips and tricks I’ve picked up along the way to lessen their workload. As well a big part of my talk is absolving maintainers of the guilt of not being able to fix all of the issues. Open source maintainers give their time and their code freely but should not be expected to be on call 24/7. On the other side of the equation there are a number of things that consumers of open source can do to lighten the load of maintainers and ensure that they get timely responses on their issues. It all starts with treating maintainers with empathy and respect. Over the two day conference I was able to talk to a ton of folks from all over Asia about open source and Adobe. Sadly, not a lot of folks knew about Adobe’s contributions to open source projects which I was able to educate them on. If you wanted to know what is the hottest topic of conversation at the conference then Blockchain would be the key winner. Besides a number of conference sessions most of the hallway track consisted of conversations on how folks could utilize blockchain in their solutions. Visiting Hong Kong and getting to meet the organizers of the HKOS conference was a wonderful experience and I’d love to get back to Hong Kong in the future to see how the open source culture has grown.